If you are looking to being front and centre to your key audience within your business weather that be at an exhibition, event, trade show or even in a reception area in order to display and inform them of products and services offered is vital to success in any business. 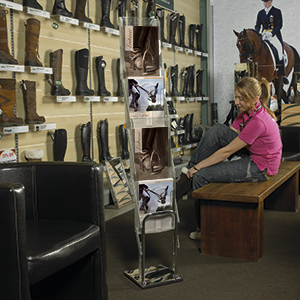 Our literature brochure stands are uniform and come in a variety of sizes and styles. The stylish, light weight frame and portable design allows for ease of assemble. 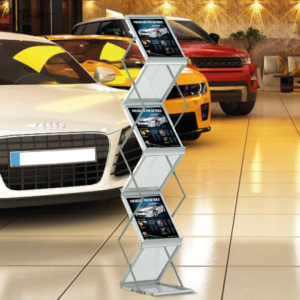 The Brochure stand range comprises of numerous product choices both portable and permanent. Order your brochure stand today! The A4 brochure/literature stand is a compact brochure holder that offers 6 shelves, 3 either facing. This allows maximum exposure from both sides on high traffic areas. It can be assembled and disassembled in seconds which can be stored in its own reinforced lockable carry case, giving maximum protection during transport.